I am really not loving where this is going. How could such a promising drama flop so epically? Oh, wait. That’s actually rather common in dramaland. Evil writers who apparently have NO idea what it means to pace anything properly or even develop a storyline properly. The writing major and would-be-novelist in me is completely cringing. Although I’m sure my horrible first attempt at writing a believable novel is trash, but at least I know it. The writers for this drama haven’t seemed to figure that out yet. Dal Soon admits her lie and that Hae Joo is really Geum Hee’s daughter. This worries Gi Chul and both he and Geum Hee ask her what she’s talking about. Dal Soon then confesses the yellow outfit is what Hae Joo was brought home in. Gil Chul does his best to cover his lies, and Dal Soon confesses that even that picture of Hae Joo and Yoo Jin is the same. Geum Hee then reveals that Hae Joo is NOT Yoo Jin. Dal Soon wonders what she means. Geum Hee burned the picture and does not have it anymore. Besides, she did a DNA test that proved that Hae Joo isn’t her daughter. This floors Dal Soon. Gi Chul tries to force her out saying that it’s because of Chang Hee’s and Hae Joo’s breakup. 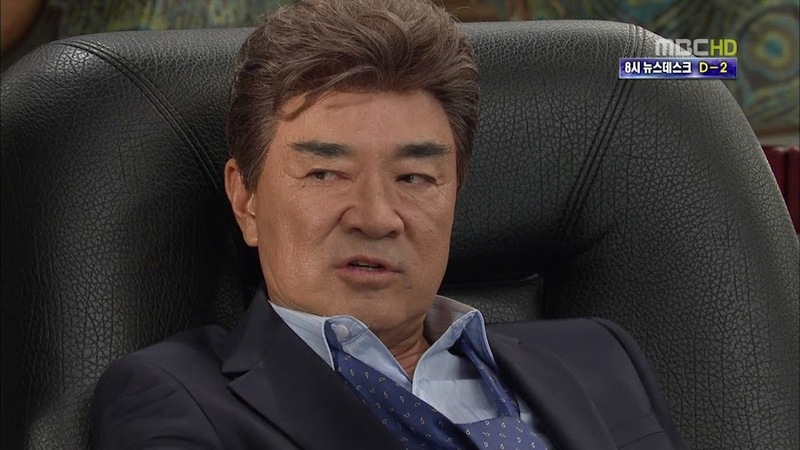 Gi Chul then accuses Dal Soon to be after money. Low blow, dude. Dal Soon walks out of the house in even more confusion. What has happened? Inside, Gi Chul does what he did with Jang and Hong Chul, he paints a picture of her as being a greedy person and a liar. Geum Hee then wonders if the DNA test was wrong. Gi Chul quickly assures her again that he was with Dal Soon when she was pregnant with Hae Joo. Geum Hee lifelessly goes into her room while Gi Chul himself wonders how the DNA test could say Hae Joo ISN’T Geum Hee’s daughter. San watches Hae Joo work and wonders how his dad could love his mom so much as to throw everything away. He then goes over to her and notices she is working on a new version of the azimuth thruster. He believes it could become stronger, but won’t that new way make it heavier? Hae Joo believes that can give it more power. Will her idea work? She’s optimistic. 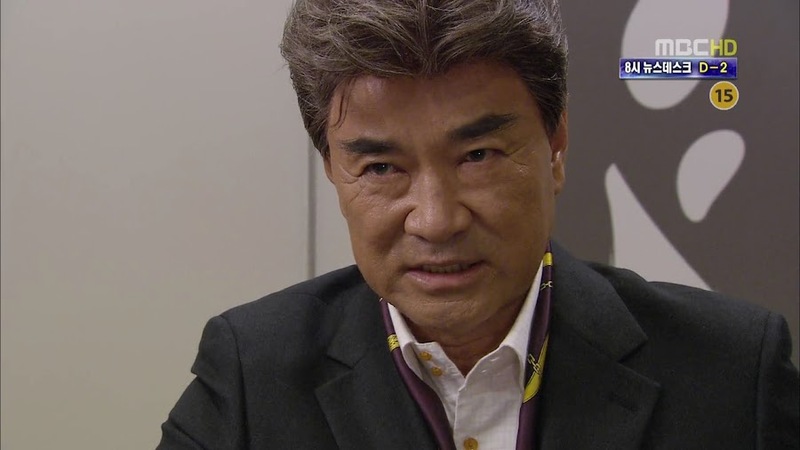 Meanwhile, Il Moon who also doesn’t want Hae Joo back tells Chang Hee he will take care of the thruster deal. Chang Hee lets him do that. The new version of the propeller lasts a bit longer, but still isn’t the right design. She says she will keep working at it and making new designs until they perfect it. San then brings up money. The truth is that he doesn’t have enough to cover all this trial and error. Not to mention he’s paying on the loan for the propeller factory. This shocks Hae Joo. Is it really all that difficult? How stupid can she be? Hae Joo apologizes for only thinking of herself. San does tell her to keep going and do what she wants until she gets it right. The two then go out to eat. San was taking the meat off the bone for her and she just takes it from him and begins eating everything in sight with her hands. San looks rather uncomfortable with this and won’t even eat the piece she ripped up. Hae Joo says she washed her hands so they are clean. San then wipes off his hands and asks if she won’t lick his fingers, too. This earns him a spoon knock to the head. LOL. Hae Joo comes in and finds Dal Soon in Jung Woo’s room trying to sneak out the picture. Dal Soon then reveals that she told Geum Hee about Hae Joo, but Geum Hee denies Hae Joo is her daughter. For Hae Joo, this means the case is closed, but Dal Soon knows she isn’t wrong and wants to take the pictures as proof. She also wonders why Hae Joo doesn’t feel wronged or angered. Dal Soon wishes for Hae Joo to go and crush these people. Hae Joo says that she will find another job and support her family. Dal Soon doesn’t like that Hae Joo is doing everything and wishes that Hae Joo could lead a better life. Hae Joo says that she won’t be happy at the Jangs just because they have money. 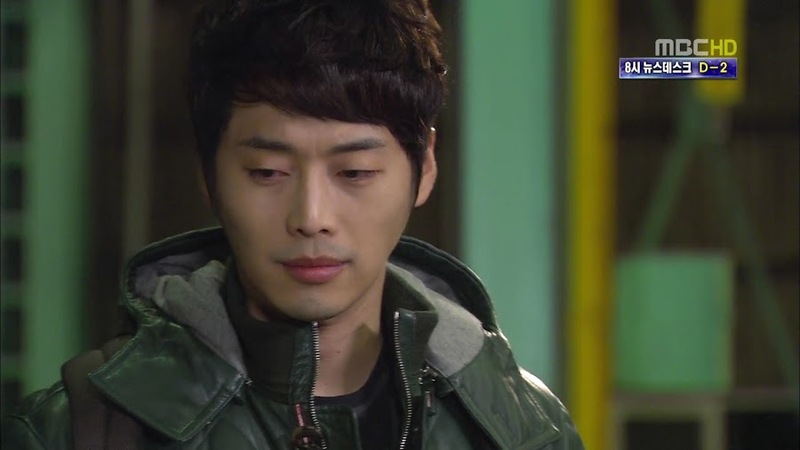 This makes Dal Soon sad, especially when Hae Joo accuses her of rejecting her yet again. Dal Soon assures her that isn’t the case. Hae Joo then threatens to run away to Gye Jae and live by herself. Dal Soon tears up and says its because she feels sorry towards Hae Joo. We end in tears, a hug, and an apology. Looks like Geum Hee is really wondering about whether or not that test is accurate. She calls up her doctor to ask if its possible for DNA tests to be wrong. Enter Il Moon and she quickly hangs up. He notices the papers and she quickly rushes to put them away. He then asks if they can have a talk. He then apologizes to her for his recent actions and attitude towards her. LIES. He says he got so mad because she was looking for Yoo Jin. Geum Hee then asks how he found out about her. IL Moon then says he overheard her talking to Bong Hee. Geum Hee then reveals that when Il Moon’s mother died, Jang was with her because she had tried to commit suicide after Yoo Jin’s death. Il Moon says it doesn’t matter. His real mother is dead and Geum Hee is still looking for her lost daughter. He cries and says that he’s lonely and his father will never recognize him. Why can’t Geum Hee recognize him as her son? She holds him and apologizes for only thinking of herself. She won’t let that happen again. Just when I think Il Moon wasn’t completely BSing he grins. Oh well. 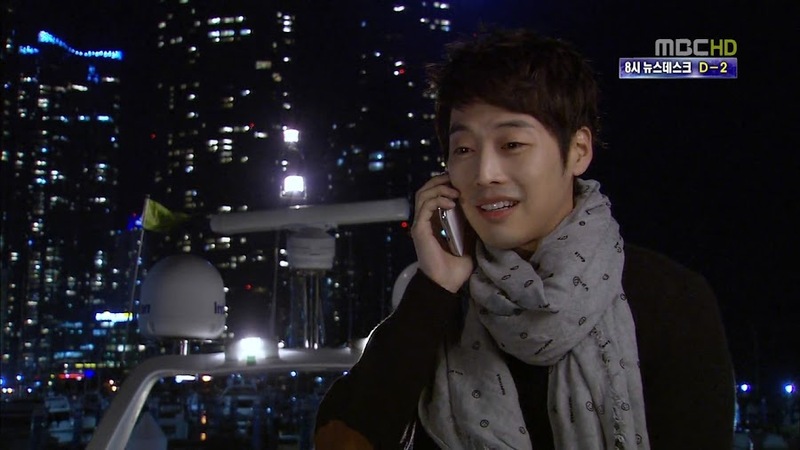 Jung Woo is called into work with information that the dummy phone is being used by someone related to Cheonji. They can’t trace who, but know its definitely someone from there. Meanwhile Chang Hee eats dinner with Jang and wonders why Jang feels the need to interfere with San. Jang says it all comes down to wanting to pursue domestic drilling. Jang then asks if Chang Hee is concerned with Hae Joo coming back. 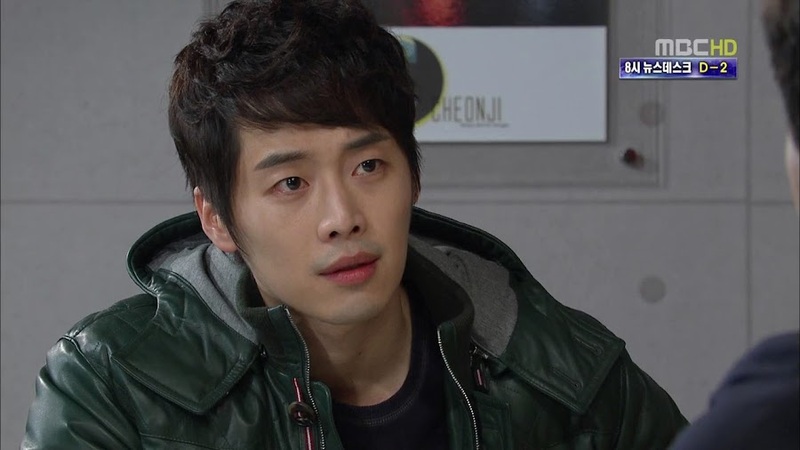 He says no, and Jang then asks if Chang Hee knows why he’s keeping him by his side. 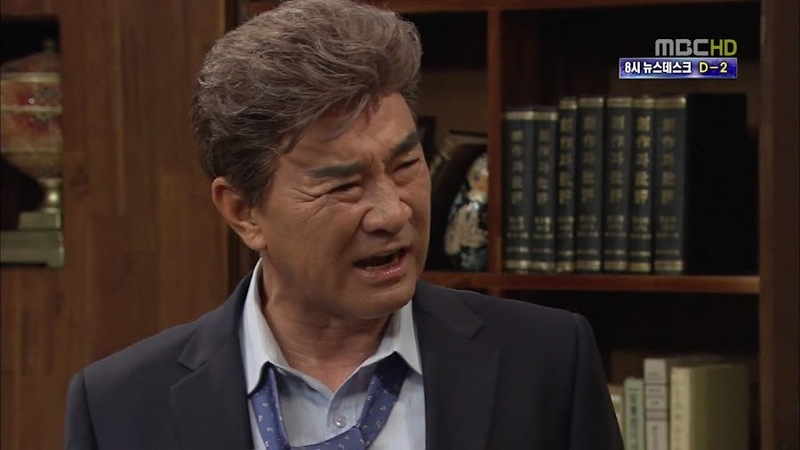 Jang then reveals that he keeps Chang Hee by his side to protect his faulty son. As long as Chang Hee doesn’t get greedy for the number one spot, Jang will compensate him handsomely. Jang warns him again about going after the top spot and Chang Hee assures him he won’t. More lies. Tis the lies of the youth to the adults this episode. After dinner with Jang, Chang Hee goes to the bar where he morosely drinks alone and recalls his good times with Hae Joo and then the slap. Guess this devil isn’t completely without conscience. Enter In Hwa who quickly chases out the girls she came with so she can be alone with Chang Hee. She asks why he’s drinking alone and he says its all her fault since his heart is filled with her but he’s still the butler’s son and she’s still on top. That’s Chang Hee for you. He turns every situation with In Hwa into an opportunity. In Hwa then asks how far he got with her. When Chang Hee hesitates, she angrily leaves thinking they went all the way. Chang Hee stops and grabs her and pulls her in close and gives her a nicer, passionate kiss than the first. He pulls away and asks why that’s important when their own future together is much more important. Blech. So…does that mean they DID go all the way in the hotel after the rain? And I must say that what does it really matter? Why does everyone get so bogged down about past experiences? It’s stupid. Chang Hee, despite the fact he’s a soulless scamming devil, is right—it’s the present and the future that matter, not what happened with someone else in the past. Meanwhile, Bong Hee is trying to do things around the house for Jung Woo, but is failing miserably. She burns a whole in his dress shirt, machine washes a sweater that needs to be hand washed, and washes whites with colors. She epically fails at housewifery. Jung Woo is livid and Bong Hee tells him she did this all to help him recharge and even made him eel. She rushes out to tech on the eel and finds Sang Tae eating the eel and drinking her precious raspberry drink. She immediately attacks him for his taking without asking. LOL. So funny watching him getting beaten by a girl. He says the drink and eel is better than medicine as he doesn’t even hurt after that beating. Omo…SO thick skinned is our Sang Tae. San is looking at blueprints and recalling Hae Joo’s disgusting table manners. He takes up her headband. WHY did he find that disgusting display beautiful? He then goes out and calls Hae Joo. What is she doing? Working of course. San then invites her out to his yacht, but Hae Joo is suspicious and doesn’t want to go. San insists he’s on his yacht and Hae Joo wonders what he really wants. San then says he wants to go hiking. Hae Joo agrees and then says he must do what she wants as well. She wants to go to an amusement park and ride roller coasters and viking ships. San points out his fear of heights. Does Hae Joo think this will deter him? Hae Joo then says he should stop and goes to hang up. San says he has something important to say and asks if she can draw (like the blueprints an stuff). Hae Joo angrily hangs up and San looks down at her headband. Doesn’t she know he called just to hear her voice? She seriously has no feeling. Awwww, poor San-oppa. In Indonesia. what Il Moon was investing in blows up. Literally. The office is in chaos thanks to this and Il Moon is no where to be seen. Chang Hee comes out as the local embassy wishes to speak with them since the loss was greater than imagined. Oh, and lets not forget innocent people died. Enter Bong Hee who rushed in after seeing the news. Jang turns on her and blames her, but she iterates that she was against the Indonesia deal from the beginning. 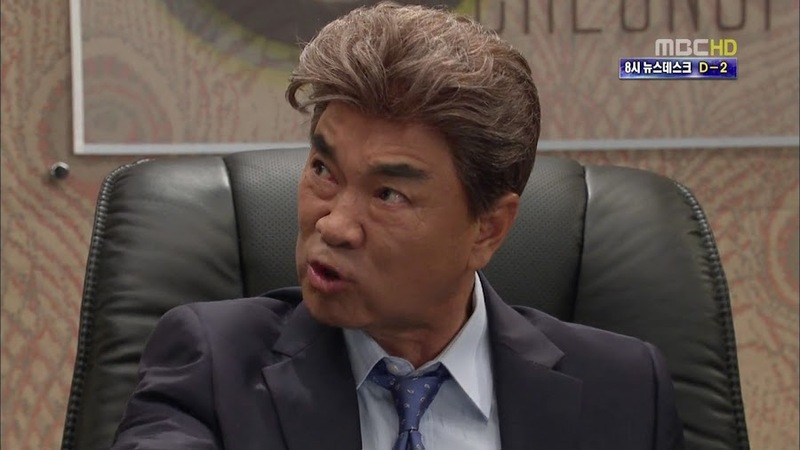 I’m sure Chang Hee is secretly dancing with glee inside as this will be a heavy blow. And just what is Il Moon doing at this critical time? He’s paying Sang Tae a visit. He takes him out for an expensive lunch. Il Moon ribs him for leaning on Kang San and Sang Tae complains about how San left him their to suffer. Looks like Il Moon’s brilliant plan is to use Sang Tae to get the propeller information from the Kang factory. Of course, Sang Tae isn’t all that helpful because he just doesn’t care about the happenings in the plant. Then Il Moon asks if they are friends (of course since Il Moon treated him to an expensive meal). Il Moon then brings out an envelope with LOTS of money in it. Il Moon says that if Sang Tae listens it him, he’ll get TRIPLE that amount (it’s like 4 million). 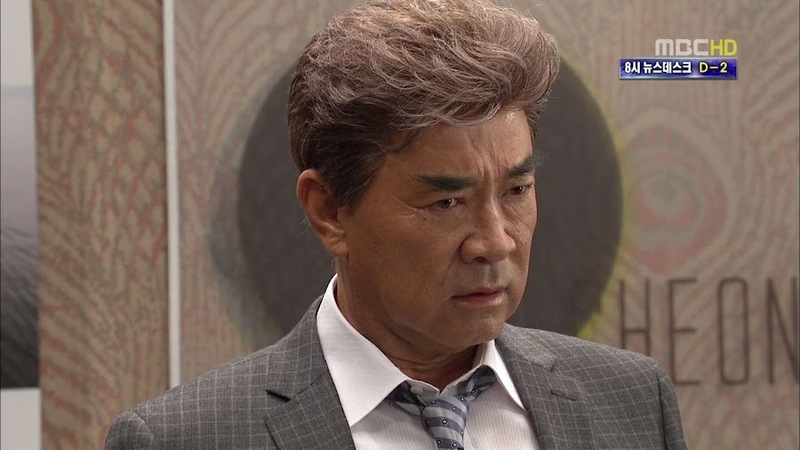 The question is now, will Sang Tae betray both the Kang family and his own for the rather large amount of money that Il Moon gives him? Sang Tae is weak when it comes to money and still stupid. But here’s hoping that he won’t be that stupid. But it is Sang Tae we’re talking about. It looks like Cheonji was “indirectly” involved in Indonesia through the UK, so they can avoid heavier damages, but since it is known that they are involved, they can’t avoid ALL responsibility. Jang drinks at his desk and wonders if they can liquidate anything to cover the loss. Chang Hee replies its difficult because they’d have to say why they were liquidating anything. The shares are already dropping and the trust in Cheonji is dropping like crazy. Can Jang pull out of this or will he crash and burn? 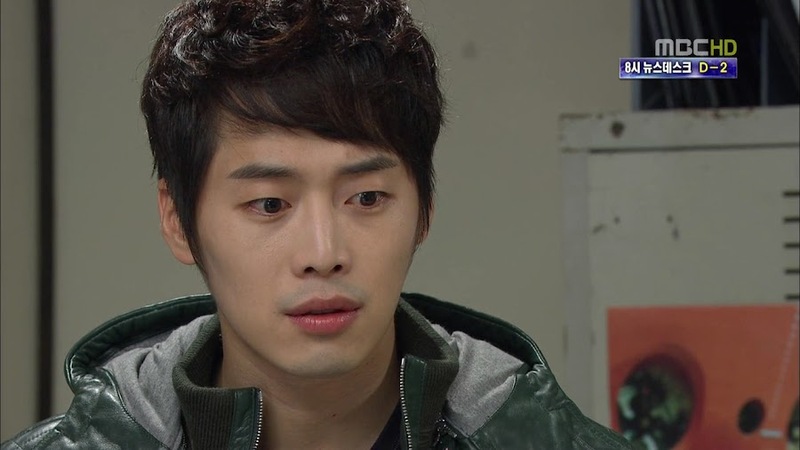 Hae Joo and Sang see the news and Hae Joo is immediately concerned. San doesn’t get why since this is the same company that fired her. He then shuts his laptop and brings out the new plans. 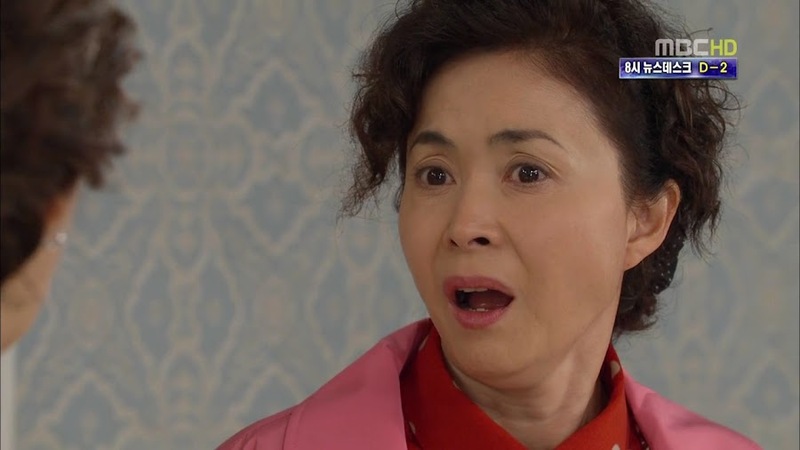 Hae Joo is surprised as they aren’t the same as before. San took the liberty to make some adjustments as she herself did. 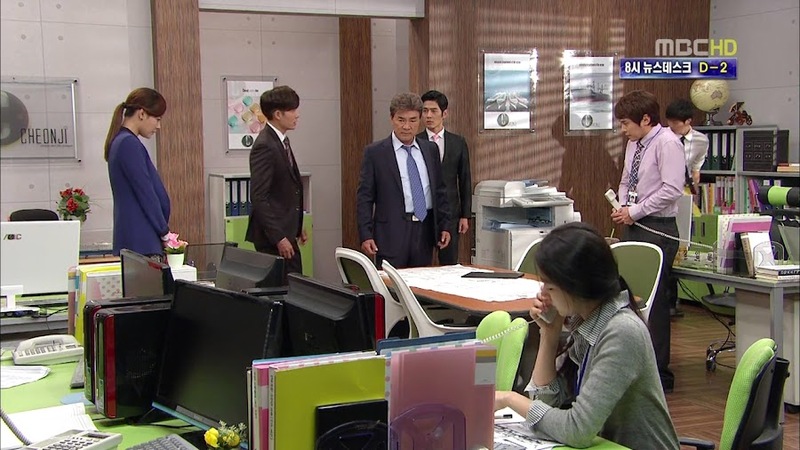 The two then look around for the original plans and Hae Joo stumbles across the memorandum. San asks what she’s looking at when she’s already seen it. Hae Joo asks when his parents died since it wasn’t written (well…DUH…since that is supposed to be Kang Woon’s personal memorandum). San tells her what Bong Hee told him. Starting next year, he’ll start performing the death rituals. The dates rings a bell with Hae Joo. The Kang family’s death is only one day apart from her birth father’s. Hearing this really disturbs San and he rushes out. Hae Joo then gets a call from Jang. So where did San rush off to? He has to see Geum Hee. She is happy to see him and San cuts right to the chase about his father and then asks about her former husband. Has she ever seen a Memorandum book that his father gave her dead husband as she was the one who handled her husband’s affairs after his death. No, Geum Hee isn’t aware of such a thing because she was in a daze after Hak Soo’s death. She then reveals that Jang took care of everything for her. Looks like San is putting almost the entire puzzle together. Hae Joo meets with Jang and wonders if everything is okay since the disaster. He tells her not to worry about it and asks her to come back to the company. Hae Joo says Chang Hee fired her. Jang says that’s because Chang Hee didn’t recognize her talent and that he was uncomfortable with her around. Jang even offers to reassign Chang Hee to a different position. Hae Joo tells him not to and that she is now working in R&D as she wanted to work on building drill ships. Jang says he knows that she’s been interested in drill ships since she was younger and happily welcomes her back. Oy. What a dumb move. I know she wishes to build an ENTIRE ship, but does it make ANY sense for her to go back to this company? ESPECIALLY knowing how underhanded things were being run to begin with? Anywho, the office is still in chaos when she happily enters. The whole office is busy with the mess. Jo then sees her asks Hae Joo why she’s there. Hae Joo smiles and gives her a warm greeting. Wow. This girl…how can she NOT understand anything? A normal person should be able to pick up on the overall vibe, but I guess Hae Joo’s just too happy to be returning to the work she wanted to do. Enter Chang Hee. She says Jang told her to report to work. Chang Hee says he knows, but there is nothing for her there to do so she can just go assist Ryan Kang. Got to love how he’s distancing himself from San by calling him that now. Jang is worried. If things continue like this, the company will be in dire straits. Looks like Jang is putting a lot of faith in “that kid.” Here, I’m assuming he means Hae Joo…or it could be San. I really don’t think he means Chang Hee and definitely NOT Il Moon. Hae Joo returns to work with San who is livid that she returned to Cheonji. 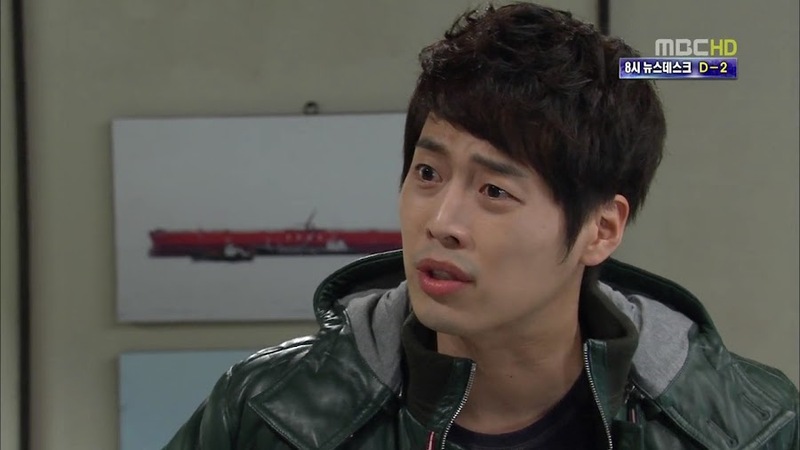 Hae Joo is surprised that he’s so angry. Um…well..as always, it is the people around Hae Joo who express what she herself should be expressing. Unless she was completely and desperately in need of that job, she should never return. And she wasn’t desperate. Despite San’s difficulties, he would be able to pay her more than enough. Why would she want to go back and work under Chang Hee? Hae Joo states she worked hard to get into that company and that had nothing to do with Chang Hee. Hae joo then throws back San’s words about her needing to become stronger. She’s NOT doing it in the right way. Hae Joo says she will work for both him and Cheonji and San should stop acting like a child. San then says he can’t take it anymore. She should stick with one thing and do it with a serious mind. He then angrily leaves. You tell her, San-ssi. At the Chun house, Sang Tae has brought a feast of meat for his family. They all wonder how Sang Tae had the money since payday isn’t yet. Sang Tae lies and says it was a bonus for all hard work he’s been doing. This makes Dal Soon happy as her son is FINALLY growing up. Did he get a promotion already? Sang Tae tells her to stop mentioning San and that they should have Hae Joo quit working with that brat. Gi Chul has come and is eating in front of the TV when In Hwa comes in. Why isn’t he at their house eating? Because Chang Hee isn’t there, Gi Chul won’t eat there, too. In Hwa then comes over with presents for Gi Chul. This shocks him. In Hwa smiles and leaves and Gi Chul opens the one present. It’s a pretty purple sweater she handpicked for him. He starts grinning and chuckling again. Jang comes home and Geum Hee asks about his taking care of Hak Soo’s things. Did he happen to see a memorandum? Jang lies and says he never saw it. Why is she asking now? San came asking after it. I’m a little confused as Jang looked rather surprised at hearing mention of the book. Did he or did he not send it to San? 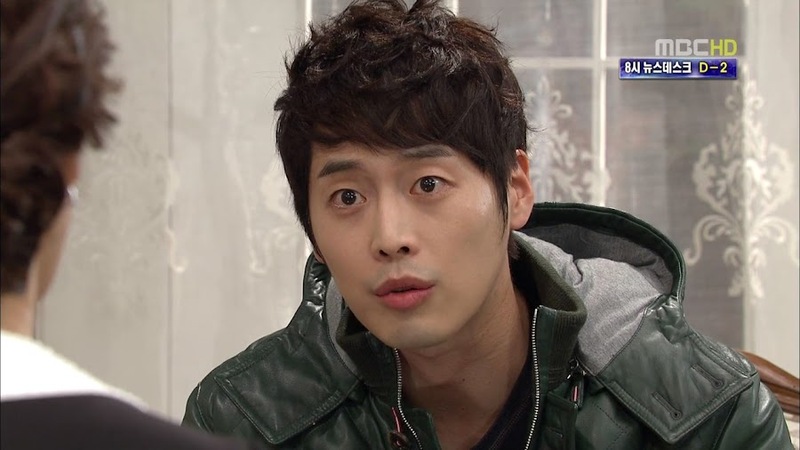 Or is it just his shock that San brought the matter to Geum Hee’s attention? Enter Il Moon to get savagely yelled at by Jang for the Indonesia mess. Does he still not know? Nope, Il Moon was completely in the dark about the Indonesia matter. Il Moon tries to say that he tried to get them to stop and Jang slaps him. Geum Hee then rushes in to save him. He couldn’t have done something bad enough to warrant a beating. 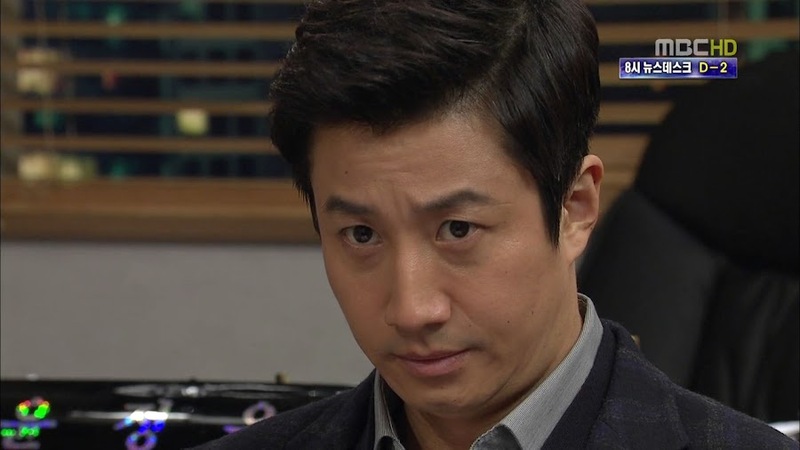 Jang says that Geum Hee doesn’t know the trouble he’s caused at the company. Geum Hee doesn’t know and doesn’t want to know as that’s company business and has no place in how the kid should be treated at home. She then warns Jang that she will not stand by and let him beat her son. Omo. Great. You know, protecting your kid is a good thing…except when it isn’t. You should NOT be blind to your children’s faults at the end of the day. Il Moon stole money from the company and did all sorts of things…but that’s okay because that’s at the company and not at home? What a worthless parent. I mean, Jang shouldn’t have raised Il Moon constantly talking down to him, but at least he gives his son a smack when he needs it. San meets with Jung Woo to confirm Hak Soo’s death on August 13th. 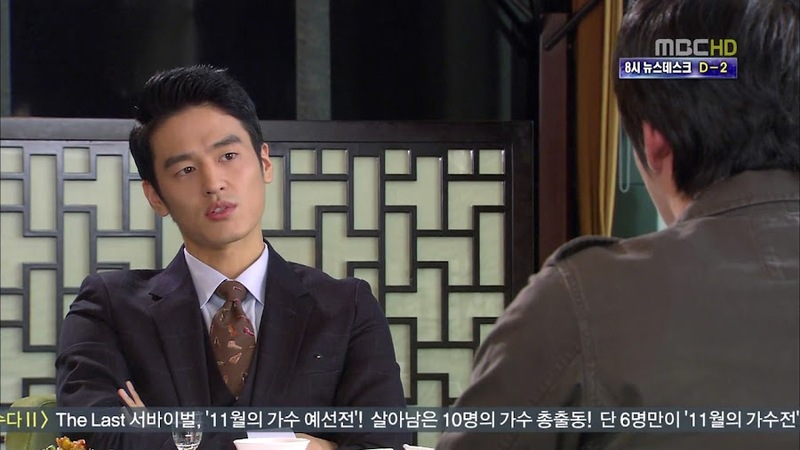 Jung Woo does confirm this and San reveals his father died in a traffic accident on August 11th. One was shot the other was a car accident, but something seems odd here, especially give that the deaths were so close together. Not only did they both believe in oil in the 7th mine lot under the ocean, but they both had ties to Jang Do Hyun. Jung Woo asks him what the point is. San says that now Jang is interested in the 7th mine lot. Isn’t that too much to be a coincidence? Jung Woo isn’t biting since there is an eyewitness that says Jang tried to save Hak Soo. Jung Woo reveals all the witnesses and Park Gi Chul getting shot as well. Didn’t they do an autopsy? Unfortunately not. This makes San feel something else isn’t right. How so? San then brings out the book that Woon intended Hak Soo to have. One step closer. He’s the only person progressing in this drama. He goes back to the factory where he comes across Kang drinking. He walks right by him, but Kang calls out to him. San doesn’t want to talk right now, but promises to talk to him the next day. He then goes inside where Hae Joo is working on another propeller sample. He paces back and forth and she tells him to leave . He refuses since its his factory. He then notices the design isn’t the same. Hae Joo says it is, she only changed one tiny part. He then asks why she is mad at him. Hae Joo replies he was mad at her first. He gives her a sort of roundabout apology that has her laughing (the one who farts is the one who gets angry first) and then tells her to go with him to Cheonji tomorrow. She then yells that he told her NOT to go there. He goes to slap her head, but she dodges. 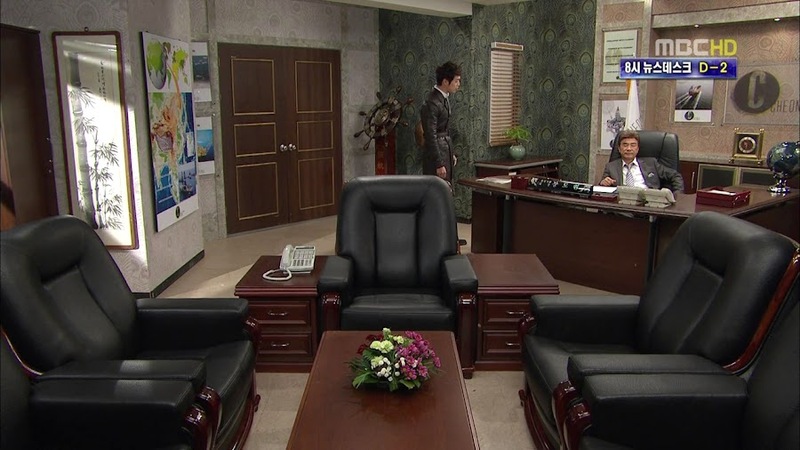 He then bows and says “president.” Hae Joo is fooled and turns, allowing San to hit her successfully. He then rushes off before she can retaliate. She doesn’t though and just laughs. She knew he’d do something like that. Why does everyone end up standing in front of the Jang house staring in? This time it’s Jung Woo. San and Hae Joo then inspect the drill ship. San says everything is going smoothly and really all that is needed know are the thrusters. Hae Joo stops and stares at the cables. San says they are strong and will hold up. Hae Joo says they are the wrong ones and can be corroded which obviously isn’t a good thing. San says he already knew about this. He was going to wait and hold out for another month, but because of his smart pupil, he must go in and fight. What does that mean? 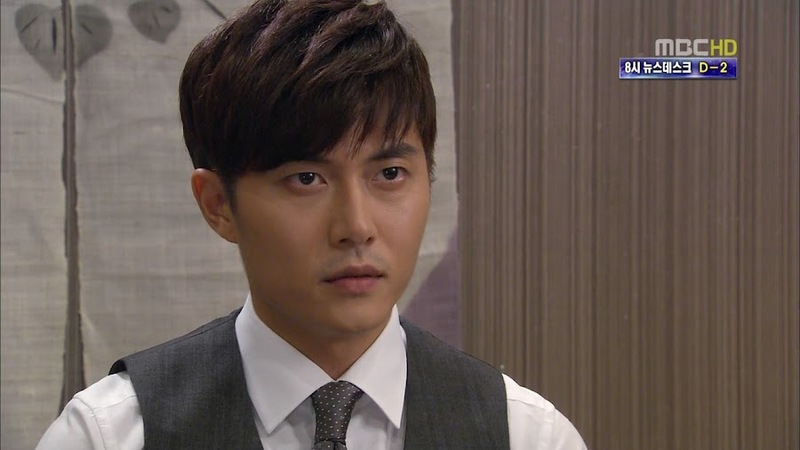 He confronts Jang about Il Moon’s bold moves. Jang tiredly asks what it is now. San responds with asking how much money was embezzled from the company. Jang again wishes to know what is going on. 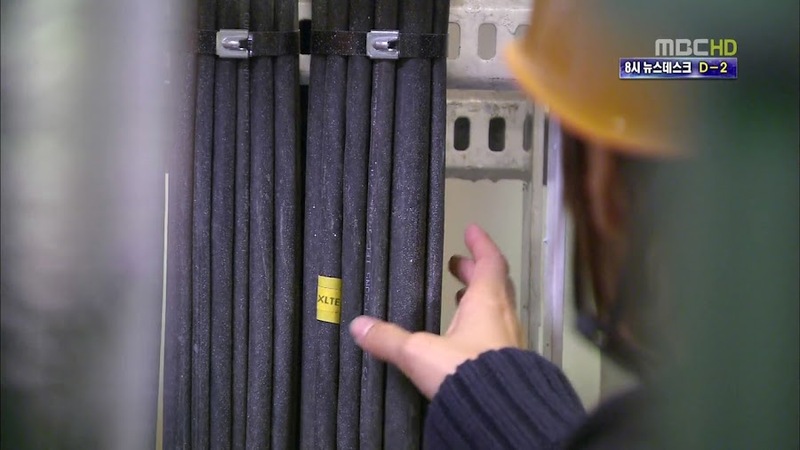 San then angrily states that inferior cables were used throughout the entire drillship. Jang immediately gets up. Is this true? Wasn’t the Indonesian incident bad enough? That was only half a dozen dead. With this drill ship that’s over 200 lives at stake. Will that explosion finally sober Jang up? Jang angrily asks how things could have progressed like this. San then tells him all this stuff has to be torn out now and redone which will be another 3 months and DOUBLE the cost. Jang falls back into his chair. He then rushes to his son and Chang Hee holds Jang back as he tries to beat Il Moon to death. Il Moon makes quick his escape. 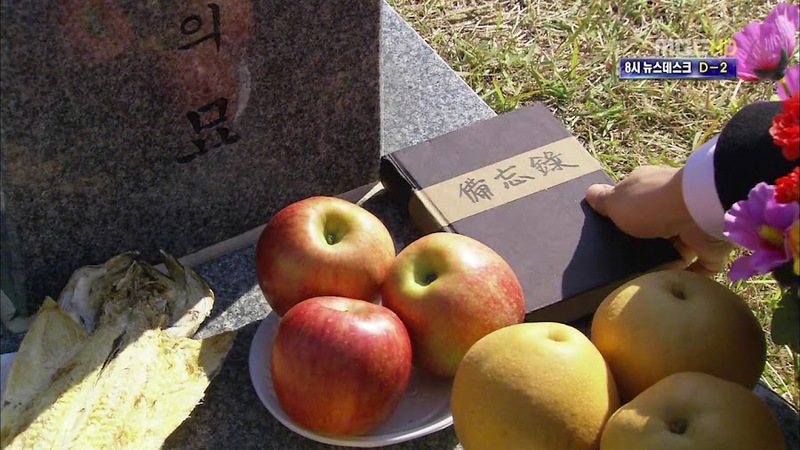 Jung Woo takes the memorandum and places it on his brother’s grave. He apologizes. If those rumors were all true back then, can Hak Soo become a ghost and tell him? He then tells the men with him to dig up the grave. Is this necessary as only ashes remain? Jung Woo says it is as he needs to know the truth. 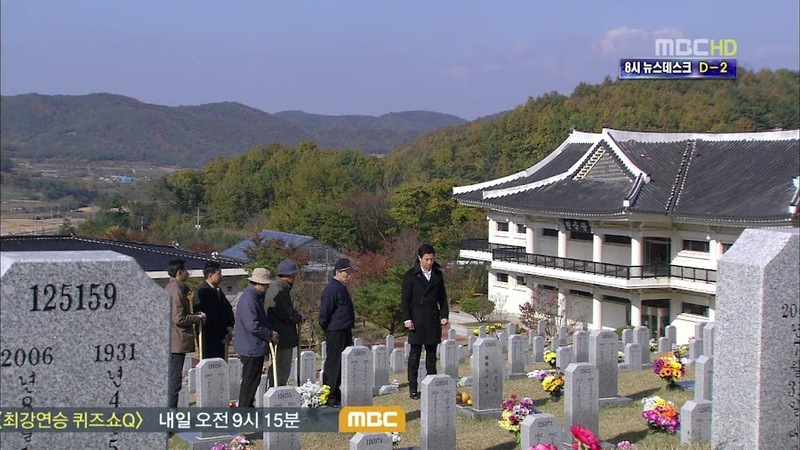 I guess trying to find if Hak Soo took anything to the grave with him that might show just who killed him. Jung Woo is then presented with a box. Inside is a picture of Yoo Jin and what looks like two burned bullets. 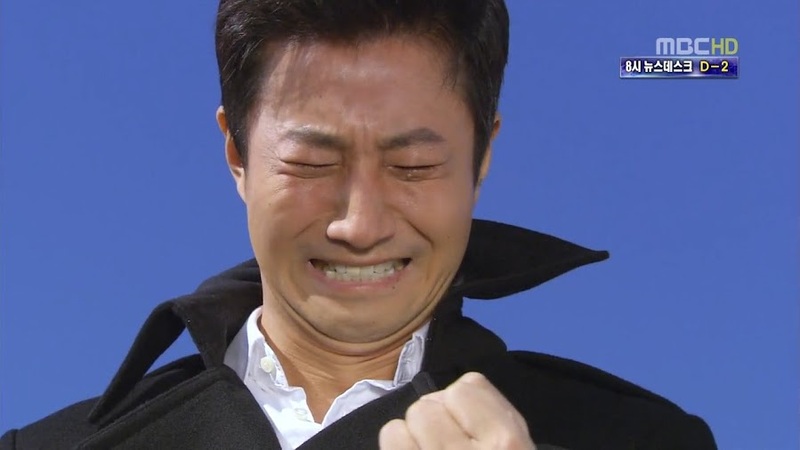 Jung Woo then clenches them in his fist and cries. Yeah for another person moving forward. 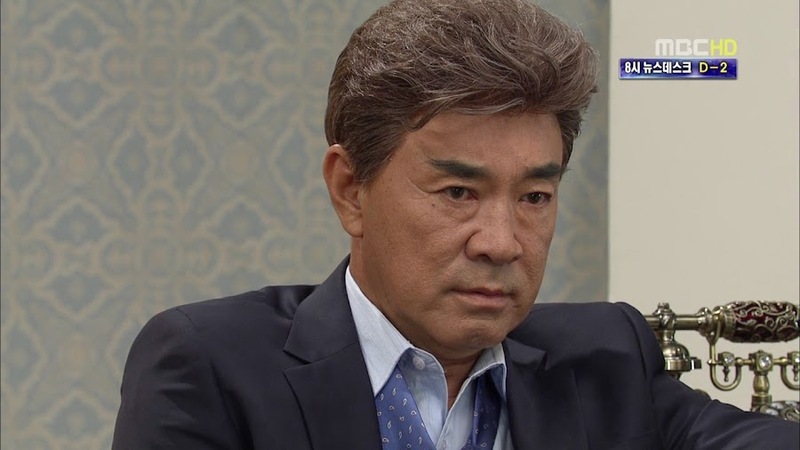 In Hwa angrily demands to know why Chang Hee brought Hae Joo back. 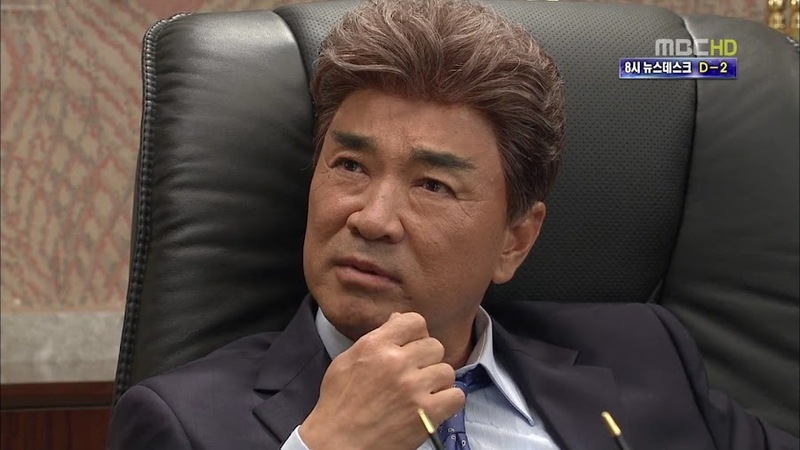 Chang Hee says he didn’t want to, but it’s on Jang’s orders. 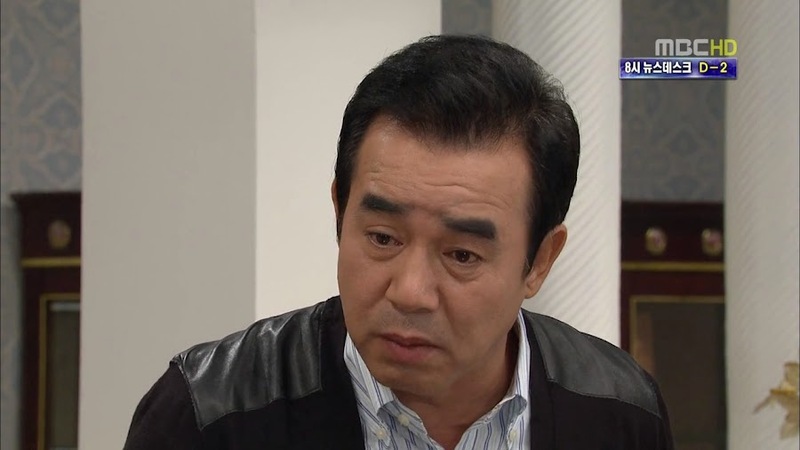 In Hwa then tells him to get up so they can ask Jang to re-fire Hae Joo. Chang Hee doesn’t and she rushes off. 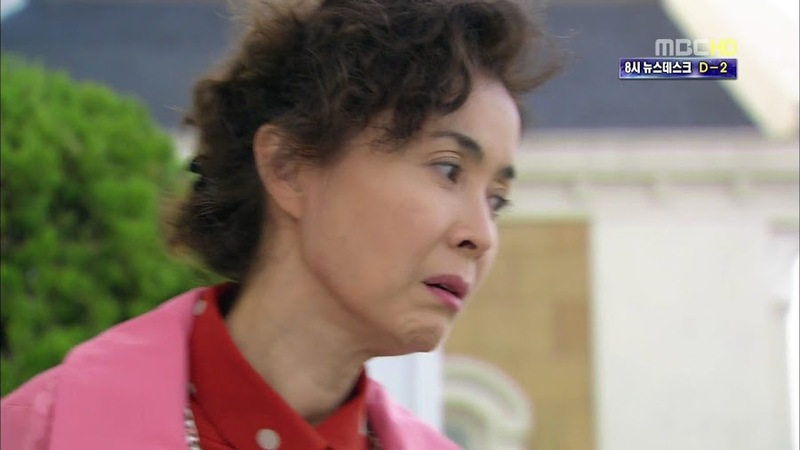 Chang Hee chases after her and tells her not to meddle in company affairs. In Hwa says she’s doing this as a favor for him. She then notices Hae Joo and pulls him in for a kiss. Hae Joo stands still completely shocked and San who comes up behind her does as well. End episode. I’m sorry it’s SO obvious when you’re looking at another person when making out with someone. How tacky…sleazy…and disgusting, I also find it disturbing based on just what the kisser’s expression is, too. They say that the definition of insanity is doing the same thing but expecting different results each time. If you do not change what you are doing, how can the results differ? Hae Joo isn’t changing at all (she’s still a doormat and an idiot). Neither is Chang Hee (really, he’s just embracing the inner darkness he’s always possessed) or In Hwa (she’s as childish and as selfish as ever). Really the only one progressing and moving forward is San. I’m kind of sick of hovering. That’s all we’re doing. Going in circles with repetitive plot and no progress. No extensions please as this is already painfully slow and we need no more reason for it to get even slower than it already is. And why is Chang Hee getting all the action? San only ever manages to get beaten by Hae Joo. Chang Hee gets not one, not two, not three, but has like FOUR kiss scenes already. Sheesh. It is really getting hard to root for Hae Joo at this stage. I’ve missed the feisty, intelligent and perceptive HJ. But then someone commented over on soompi, that maybe life was just too hard, so she bend a little. So, even though I prefer a lead who’s able to stand up straight, I thought I’ll give her a leeway. But, we only have ~10 episodes left and she’s seriously getting worst as the drama progresses. The character is just so clueless. Like mother, like daughter. Both have selective hearing, vision and memory. It’s irritating that her cluelessness causes pain to the people who’s been there for her. ahhhh!!!!! I’m not saying that Hae Joo wouldn’t be weaker after her horrible experiences…but I think they watered her down too much. I find it quite interesting that the only time she really seems to be herself is with San and Il Moon. That’s when you see the little girl we came to love buried in the adult. I am sick of her attitude and actions. It’s amazing how much she IS like her birth mother. I guess this goes she show blood is stronger than anything. Hae Joo who constantly was complaining of Chang Hee’s selfishness (just not using those words) is utterly horrible at understanding and gauging things. Like when she goes into the office all happy about taking her job back and getting put in R&D. Hello? Did you forget you joined a sinking ship? Meh. I agree. Cheering for San and Jung Woo to put the puzzle together and get justice once and for all. Oh, let us not forget Bong Hee, she will always refuse to be a spectator. Yay for a truly strong (and yet childish and innocent) female character in this series. agree the plot become boring and to slow….i dont see any progress esp…in shipbuilding….and HJ becoming dumb and stupid in making a decision since she willgoing to work again at the company…just like KS said have a PRIDE please….. The adult Hae Joo’s acting is less to be desired. I like the child Hae Joo’s act much much better. And the more I watch this drama, the less I am attracted to it. Dragging dragging dragging while it can be made into a better paced story. A few things I’m not quite sure about: Was Hak So’s memorandum what the ninjas and Jang were after in the first episode? Was it information about the oil field? No. 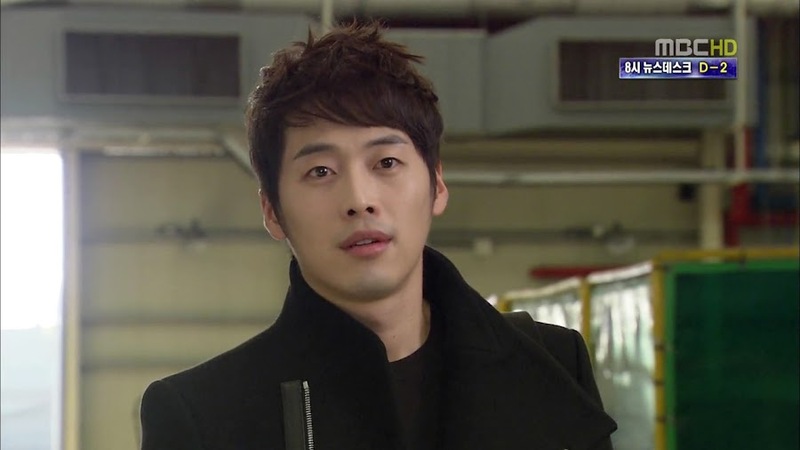 The memorandum came into Hak Soo’s possession about the same time he died. What the ninjas were after was the film canister that Hak Soo had. It contains some information on the sector 7 part of the ocean by Korea that proves there’s oil to drill.